The White House engaged in two furtive gambits last week that painfully exposed the Obama administration's amateurish, deceitful Middle East-Islamic policies. The first case concerned the thorny issue of Jerusalem's legal status in American law. In 1947, the United Nations ruled the holy city to be a corpus separatum (Latin for separated body) and not part of any state. All these years later and despite many changes, U.S. policy holds that Jerusalem is an entity unto itself. It ignores that in 1949 the Government of Israel made western Jerusalem its capital and in 1980 it declared the whole of Jerusalem to be the capital. The Executive Branch even ignores U.S. laws from 1995 (requiring a move of the U.S. embassy from Tel Aviv to Jerusalem) and 2002 (requiring that U.S. documents recognize Americans born in Jerusalem as being born in Israel). Instead, it insists that the city's disposition be decided through diplomacy. Challenging this policy, the American parents of Jerusalem-born Menachem Zivotofsky, demanded on his behalf that his birth certificate and his passport list him as having been born in Israel. When the State Department refused, the parents filed a lawsuit; their case has now reached the U.S. Supreme Court. Things started to get interesting on Aug. 4, when Rick Richman of the New York Sun noted that "The White House acknowledges on its own website that Jerusalem is in Israel—as does the State Department and the CIA on theirs," undermining the government's case. Richman pointed to three mentions of "Jerusalem, Israel" in captions to pictures on the White House website in connection with a trip by Joe Biden in March 2010: "Vice President Joe Biden laughs with Israeli President Shimon Peres in Jerusalem, Israel"; "Vice President Joe Biden meets with Israeli Prime Minister Benjamin Netanyahu in Jerusalem, Israel"; and "Vice President Joe Biden has breakfast with Former British Prime Minister Tony Blair . . . in Jerusalem, Israel." Richman deemed this wording to be potentially "pivotal evidence" against the government's case. One of the pictures on the White House website that mentions "Jerusalem, Israel." At 3:22 p.m. on Aug. 9, Daniel Halper of the Weekly Standard reiterated Richman's point by posting the first of those pictures. Two hours and four minutes later, at 5:26 p.m., Halper reported that "the White House has apparently gone through its website, cleansing any reference to Jerusalem as being in Israel." 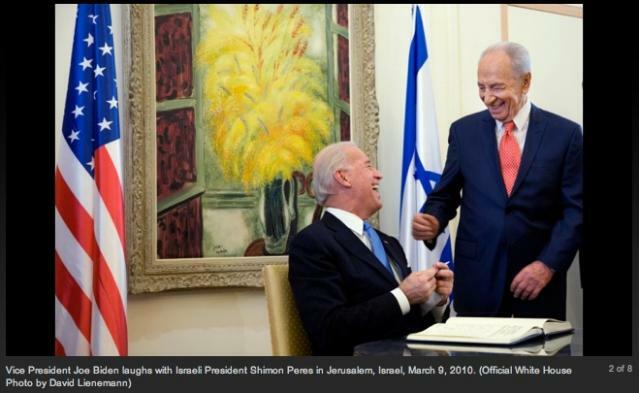 The new caption read, "Vice President Joe Biden laughs with Israeli President Shimon Peres in Jerusalem." Someone on the White House staff hoped to pull a fast one. As James Taranto noted in the Wall Street Journal, the Supreme Court does not take kindly to such pranks. Barack Obama continues George W. Bush's tradition of hosting an iftar at the White House. The second deceit concerns the guest list for the iftar (breaking-the-Ramadan-fast) dinner at the White House on Aug. 10. The White House published a guest list "of some of the expected attendees" that included 4 members of congress, 36 diplomats, and 11 "community members." To the relief of those who watch such matters, the list mentioned no American Islamists. But, it turned out, "some" was a weasel-word. 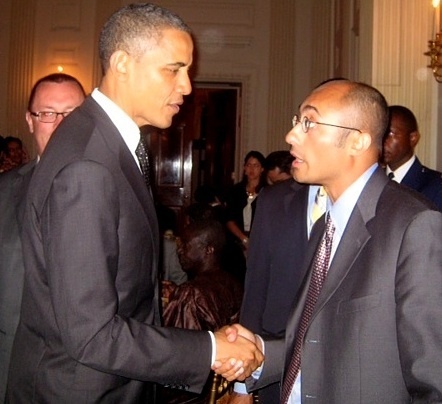 Research by the Investigative Project on Terrorism and others established that the published list did not mention the American Islamists attending that dinner, including Haris Tarin of the Muslim Public Affairs Council, Mohamed Magid of the Islamic Society of North America, and Awais Sufi of Muslim Advocates. In combination, two deceits in two days makes one wonder about the morality and even sanity of the White House staff under Barack Obama. Do his munchkins really think they can get away with such sleazy sleights of hand? 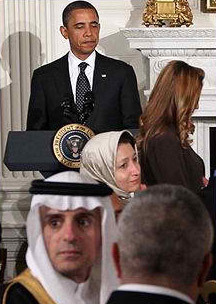 One of the Islamists, Awais Sufi, at the White House dinner. Separately, each of these deceptions warrants condemnation; together, they symbolize the tenor of a failed administration in panic over its lowest-ever poll ratings (43.4 percent approval according to RealClearPolitics.com's aggregation of surveys) and trying to revive its fortunes by whatever means necessary, even if its dishonesty might expose it to ridicule. More specifically, the two incidents point to the bankruptcy of the administration's Middle East and Islamic policies. The arrogance of 2009 remains in place, now tempered by failure and desperation. Aug. 16, 2011 update: For more inconsistencies on the first topic covered above, see the weblog entry "Jerusalem, Israel." July 25, 2013 update: Two years later, more weasel words from the White House about guests at the iftar. Note the word some in the following text, titled "Expected Attendees at the White House Iftar Dinner." Related Topics: Jerusalem, Muslims in the United States, US policy | Daniel Pipes receive the latest by email: subscribe to the free mef mailing list This text may be reposted or forwarded so long as it is presented as an integral whole with complete and accurate information provided about its author, date, place of publication, and original URL.